A 21-month, phase 2 study on the efficacy, and safety of intravitreal injections of DE-122 in combination with Lucentis compared to Lucentis monotherapy in subjects with wet age-related macular degeneration. A Phase 1b Open Label, Multi-center Exploratory Study to Investigate the Bioactivity, Ocular and Systemic Safety, Tolerability, and Pharmacokinetics following Single and Multiple Intravitreal Administrations of KSI-301 in Subjects with wet Age-related Macular Degeneration, Diabetic Macular Edema, and Retinal Vein Occlusion. A phase 3, multicenter, randomized, double-masked, active comparator-controlled study to evaluate the efficacy and safety of faricimab in patients with neovascular age-related macular degeneration. A multicenter, randomized, double-masked, phase 3a study to assess safety and efficacy of brolucizumab 6 mg q4 weeks compared to aflibercept 2 mg q4 weeks in patients with neovascular age-related macular degeneration with persistent retinal fluid. A multicenter, double-masked, randomized, dose-ranging trial to evaluate the efficacy and safety of conbercept intravitreal injection in subjects with neovascular age-related macular degeneration. Phase 3 double masked active treatment of the efficacy and safety of ranibizumab (Lucentis) compared to Visudyne for the treatment of Wet AMD. Phase 3 study for the use of radiation with the Epi-Rad 90 system to treat Wet AMD. A 1 year, phase2, double-masked, randomized, controlled, multiple-dose, regimen-ranging study of the efficacy and safety of intravitreal REGN2176-3 in patients with neovascular age-related macular degeneration. A 2 year, phase 3 study on the safety and efficacy of Abicipar Pegol (AGN-150998) in patients with neovascular age-related macular degeneration. A 2 year Phase 3 study to determine the safety and efficacy of E10030 (Fovista) in combination with ranibizumab (Lucentis) compared to ranibizumab (Lucentis) monotherapy in Wet AMD. A 6 month, phase 2, randomized, double-masked, multicenter, active-controlled study evaluating administration of repeated intravitreal doses of hI-con1 in patients with choroidal neovascularization secondary to age-related macular degeneration. Phase 3 randomized treatment study of the efficacy and safety of different doses of ranibizumab (Lucentis) administered monthly or as needed. A phase 3, two-year, randomized, double-masked, multicenter, three-arm study comparing the efficacy and safety of RTH258 versus aflibercept in subjects with neovascular age-related macular degeneration. Follow up study to evaluate the safety and tolerability of ranibizumab (Lucentis). 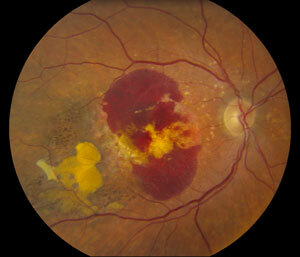 Evaluation of abicipar pegol in patients with neovascular age-related macular degeneration. Phase 3 double masked active treatment controlled study of the efficacy and safety of ranibizumab (Lucentis). A 9 month Phase 2A study that is evaluating ISONEP as either monotherapy or adjunctive therapy to ranibizumab (Lucentis), bevacizumab (Avastin) or aflibercept (Eylea). A 9 month, randomized, double-masked, active-controlled phase 2 study of the efficacy, safety, and tolerability of repeated doses of intravitreal REGN910-3 in patients with neovascular age-related macular degeneration. A 2 year, phase2, randomized, double-masked, controlled trial to establish the safety and efficacy of intravitreous administration of FOVISTA (anti PDGF-B pegylated aptamer) administered in combination with either Avastin or Eylea compared to Avastion or Eylea monotherapy in subjects with subfoveal neovascular age-related macular degeneration. A 1 year Phase 2 study that will determine the safety, tolerability and efficacy of ESBA 1008 vs aflibercept (Eylea) in Wet AMD. A 2 month Phase 2 study to evaluate the effect of ESBA 1008 applied by Microvolume Injection or Infusion in Wet AMD. A 3 month, phase 1, open-label, dose-escalating, sequential-cohort study assessing the safety, tolerability, immunogenicity, and bioactivity of a single intravitreal injection of DE-122 injectable solution for the treatment of refractory exudative age-related macular degeneration. Phase 2 study of the safety and efficacy of AGN-150998 versus ranibizumab (Lucentis) in treatment-naive patients with advanced AMD. A 6 month Phase 2 study of the safety and efficacy of AGN-150998 vs ranibizumab (Lucentis) in treatment-naive patients with Wet AMD. A 1 year Study evaluating ranibizumab (Lucentis) in Wet AMD patients previously treated with bevacizumab (Avastin) AND aflibercept (Eylea). A comparative study evaluating the different doses of ranibizumab (Lucentis). Phase 2 study of the safety, tolerability and efficacy of ESBA 1008 versus ranibizumab (Lucentis) in advanced AMD. A Phase I/II,2 month, randomized, double-masked, multicenter clinical trial designed to evaluate the safety and exploratory efficacy of SF0166, topical ophthalmic solution in the treatment of neovascular age-related macular degeneration. Phase 3 study of the efficacy and safety of Verteporfin with Photodynamic Therapy for the treatment of Wet AMD. Phase 3 Study of the efficacy, tolerability and safety of repeated doses of aflibercept (Eylea). Follow Up study for the patients treated with aflibercept (Eylea) for Wet AMD in the VIEW study.